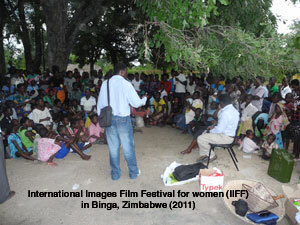 The International Images Film Festival for women (IIFF) this year for the first time, moved to the Matebeleland North region of Binga for its outreach, courtesy of CAFOD. The festival, celebrated under the theme Women With Goals ran from December 5 to 7 screened film in commemoration of the 16 Days of Activism against gender based violence. The festival reached out to over a thousand viewers at Tusimpe, Binga High School, Freedom Square in Binga town and Manjolo Drop in centre about 25km away from the town centre. Three local films were showcased namely, Nyami Nyami and the Evil Eggs (new film by Tsitsi Dangarembga), I want a Wedding Dress and Peretera Maneta. The films were empowering and inspiring as they showcased real life challenges encountered and the audience urged WFOZ to continue using film to stimulate debate and analysis of issues normally swept under the carpet. Thus film created a freer space that allowed for dialogue and the organisation was encouraged to create positive images as well as encourage people to tell their stories as a lesson to others. The films centered around linkages between gender and poverty, gender and HIV/ AIDS and gender and child sexual abuse. Strong messages were sent home such as that while poverty is said to have a rural and a woman’s face, it is high time that women become economically empowered and if this is achieved, fewer cases of gender based violence will be recorded. Similarly, on the issue of HIV and AIDS, I Want A Wedding Dress highlighted that it is normally the women that suffer the burden of caring for the sick and in most cases are accused for bringing the virus to the home. The audience also agreed that parents have a huge role in socializing and protecting their children from the scourge, for if parents play the supportive role, moral decadence is reduced and so are the cases of sugar daddies and mummies. With regards to Peretera Maneta, the audience seemed to agree that we all know a Maneta in our lives, that girl who is sexually abused but does not get love, care, support and protection by those who should be extending that to her. The film spoke strongly to this years 16 Days theme ‘From peace in the home to peace in the world’ as it encouraged parents to create safe spaces for their children right from the home environment, and ensuring that these children are protected in the outside environment too! In the film, the parents are not concerned about their daughter to such an extent that they do not notice that she is being abused. Instead, they rely on the headmaster who tells them their daughter is doing well yet he is the perpetrator. This therefore indicated the gap that exists between most parents and their children. Several initiatives to create space for women to freely interact, build confidence, attain collective power and share sensitive gender information have been introduced. As such, Women Filmmakers of Zimbabwe uses the medium of film to enable these women, especially the young to identify, analyse and find possible solutions to problems that affect them as individuals and as a group through engaging with messages in the film. Film allows viewers a chance to discuss and debate issues normally swept under the carpet as the audience will be hiding behind the character in the film yet in reality referring to a real life experience. Film is a language spoken and understood by all. This powerful medium of communication knows no color, race or creed but speaks to and informs all who engage with it.